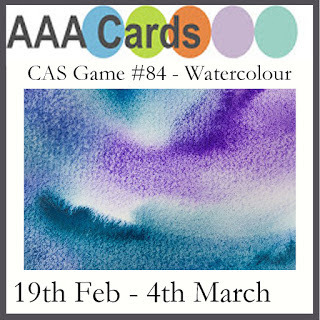 today I am taking part in the AAA Cards Watercolour challenge and I'm super excited by how this card turned out. I used distress inks in Squeezed Lemonade, Peacock Feathers and Picked Raspberry to create this card and make a watercolour background. I layered a card panel over top with the word Hugs from My Favorite Things and stamped the sentiment from the Kind Things stamp underneath. I embellished with pink and aquamarine sequins as well as Nuvo Jewel Drops in Limoncello, Sea Breeze and Rose Water. I hope you enjoyed today's card tutorial. If you are interested in seeing other watercolour cards and tutorials, click here. Wow!! Gorgeous card :) love it. Thanks for your video tutorials. Beautiful delicate and subtle watercolouring, love how it contrasts so well with the plain black greeting. Gorgeous, dreamy, pretty and delicate tones here Justine. Superb video too. Absolutely gorgeous! I struggle with watercolour but your video has inspired me to give it another shot :) Love this card! Wonderful use of color! Screaming spring!!! Absolutely fabulous! I love the colours in the background and come through the die cut so well. I just love the soft pastel colours in your die cut, its really gorgeous!